Palm Sunday: Happy Feast Day! Named after the Apostle and Evangelist St. Mark, our church is a small community of Orthodox Christians with various national and cultural backgrounds. Many of us were born and raised in different countries: the United States, Greece, Russian, Serbia, Ukraine, Belarus, Romania, Germany, Finland, Poland, and many others. We may have different traditions to follow in our everyday life, but we all have one thing in common - the same belief, the same Christian ideals, the strong desire to grow spiritually, the interest and respect to many different cultures and traditions. Our church serves people from as far North as St. Petersburg, including Sun City, Parish, Bradenton, Parrish, and as far South as Sarasota, Venice (Florida) since 1979. We hope you will be able to find answers for many of your questions about Orthodox Christianity, Orthodox spirituality, historical and cultural roots of Orthodoxy, and about its teaching and traditions. You can find useful resources for your children, and carefully selected list of Orthodox links. We cordially invite you to join us in our prayers, work for community, fellowship, and fun activities. Just be our friend! Amazon will donate 0.5% of your purchases price to our church when you shop at http://smile.amazon.com/ch/65-0197896. On your first visit to AmazonSmile, you need to select St. Mark Orhtodox Church (OCA) as your charitable organization before you begin shopping. 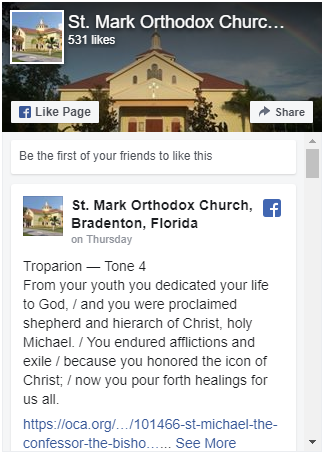 The community of St. Mark Orthodox Christian Church (Orthodox Church of America - OCA). Scrip program is a fun and easy way to support your church. Contact Nadya.